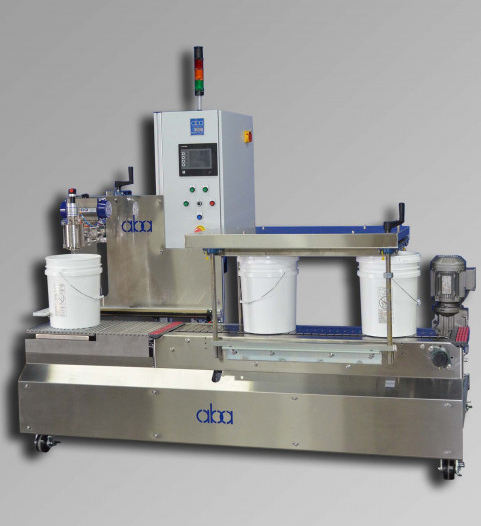 At Anthony Barber Associates, we manufacture machines to fill in either top fill or bottom fill mode. While there are advantages and disadvantages to each style of filling, deciding whether a top filling machine or a bottom filling machine is right for your business largely depends on what material you are filling, and into what type of container. Typically, a top fill machine is best suited for applications where the product is non-foaming, and the containers are open top. Top fill machines are also inherently faster at filling, so speed is another major consideration for customers contemplating which option is best for them. A bottom fill machine is ideal for filling foaming products and also those which are static prone in a hazardous environment as well as filling liquids into containers with a tight neck (narrow opening). Bottom filling involves a diving lance fill head which is lowered to the bottom of the container before filling begins. Once the lance is in position, the cycle initiates and as the liquid fills the container, the lance rises out of the container whilst keeping the head submerged in order to lessen foaming and decrease static. These machines are slower due to the travel time of the fill carriage having to lower and raise the fill heads out of containers, but are imperative for safety and cleanliness in certain applications. It should, however, be noted that bottom fill machines are capable of filling in top fill mode, thus can be functional for a wide array of products and containers. Both styles of machines can be available in full or semi-automatic designs and, as with all of the machines we offer, we will customize them to best fit your needs, fill environment, and product.